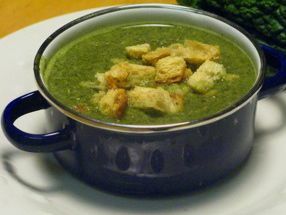 I created this soup one afternoon when I was hungry and had two bunches of tender spring turnips with greens. I cooked the greens in a little water and then puréed them with a few ingredients to balance the flavors. The result was a little taste of heaven in an almost-instant soup that I made week after week until spring turnips with greens were no longer on market tables. Other greens like kale, collards, or braising greens have a stronger flavor and take longer to cook, but you can still use them as long as you make sure they cook until tender. Hazelnut butter is my favorite local addition, but you could also add almond or cashew butter or a little cream. Serve this treasure with crusty artisan bread. Heat a heavy soup pot over medium heat. Add the water, lemon juice or vinegar, and turnip greens. Bring to a boil, reduce the heat, and simmer until the greens are tender, a few minutes. Purée all the greens and water in a blender, 1 cup at a time, adding the honey, nut butter, cayenne if desired, and salt to taste to the first batch. Return the purée to the soup pot and heat gently for a few minutes. If the soup is too thin, add a tablespoon of rice flour and stir until thickened. Serve with a dollop of yogurt if desired. Hazelnut butter is often sold at farmers' markets in the Pacific Northwest; Freddy Guys and Holmquist both offer it, but others do as well.